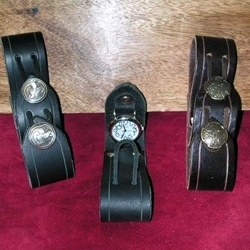 Made in the U.S. of top quality leather, this mug and watch strap is a must have for period faires and events. Keep track of when to get to the next joust, and have your tankard ready for a drink in one great looking accessory! The watch strap opens without releasing your tankard. Battery powered watch is easily serviceable. Several etching color options are available to match your look. Copyright © bytheswordinc.com 1995-2019. All Rights Reserved.